Tech bloggers are a dime a dozen. Today, anybody with an internet connection and a penchant for writing at lengths about even the smallest developments in the wide world of tech can call themselves a ‘Tech Blogger’. This has given rise to cut throat competition when it comes to garnering eyeballs. Being original is the key to becoming a better blogger. So here are some tips on how one can improvise and become a better tech blogger. Now that you have decided to be a tech blogger, define what your blog is going to stand out for. Positioning is vital. As technology is a diverse sector and there is lot to be written about and covered, choose a topic which you think you know best, be it gadget reviews or writing about industry trends. Start with something you know best. After gaining considerable exposure and knowledge within a particular sub domain, you can start exploring different fields of tech blogging. It’s always good to start with a reference in your mind. Choose blogs you like and the brands which you admire in tech world. Follow them, read what they are coming out with in terms of content and latest product announcements. Keep yourself updated with the nuances of the tech world. Some of the best blogs which will help you in understanding the know hows of tech blogging are listed below. Engadget: News, reviews, features, forums and events. You say it and they have it. Highly insightful tech blog with a dedicated team. CNET: Another blog with reviews, news articles, blogs, podcasts and videos on technology. Igyaan: An Indian blog which started as a Youtube channel for mobile reviews and today it has turned out to be a full fledge tech blogging website managed by various authors. Blogs like these have dedicated workforce who churn out content on daily basis. Some of the best Indian Tech blogs are Mindterest, Sankar Anand and Technospot. Unlike Engadget and CNET these above mentioned blogs are managed by a single blogger. Hence, can be a good model of inspiration for budding tech bloggers. Even if smartphones today are the most popular piece of technology, there are many innovative and revolutionary technologies which are coming up such as augmented reality, 3D printer, virtual reality headsets like oculus rift, Wearable tech etc. Write about them too. This will give a fresh perspective to your readers about the tech world and will help you set apart from other tech bloggers. Always remember that people will want to read your blog if you are giving away something that they do not know. This includes your perspective and insights about the tech world, products, latest happenings etc. Don’t just publish news which can be easily available from other reliable sources as well. Biggest tech bloggers and influencers always give detailed analysis of their perspective to their readers, which is what sets them apart from the rest. 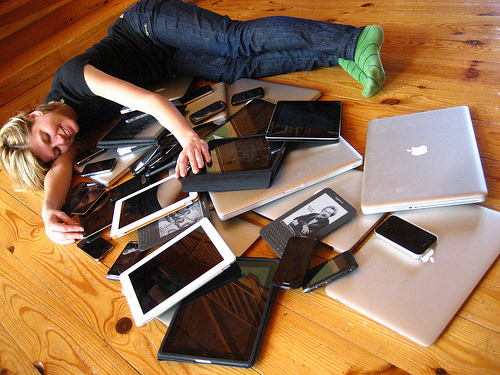 Many tech bloggers limit themselves to just writing about hardware and their updates. Not many bloggers have touched software. Make sure you cover enough about all the latest happenings from the software world too. This will help you position yourself as an all-round tech blogger. Try to network as much as you can with tech influencers, reach out to them via social media or events to gain an experience or knowledge about the industry. Try to get other tech influencers to contribute to your blog since they will bring their fresh perspective, knowledge and insight in to your blog. Bringing in tech influencers will increase the credibility of your blog. Apart from guest articles, upload video interviews with tech influencers since readers may find video interviews more engaging than long guest posts. Engage your readers since perhaps this is the most important factor in attracting and establishing a relation with your readers. Even interesting content is rendered less interesting if the readers don’t know who they’re talking to or reading from. If you have some exclusive tech blogging tips, do share with us in the comments below.